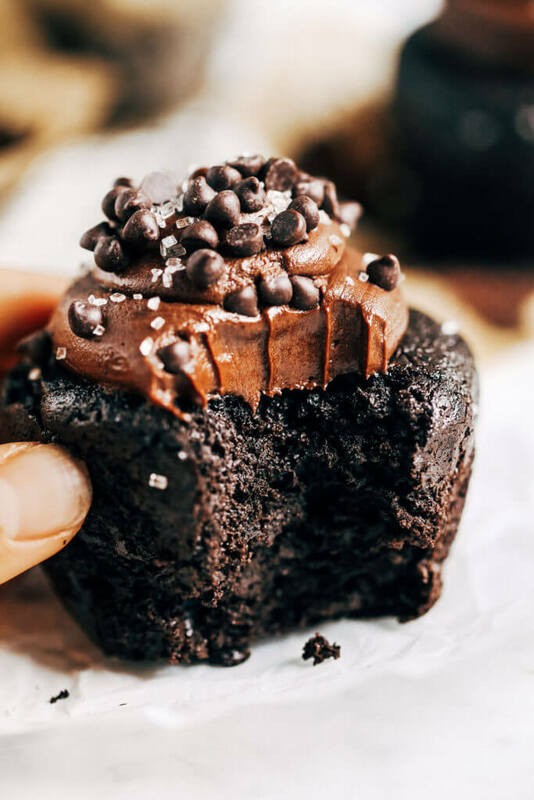 Triple chocolate paleo cupcakes will change your life! 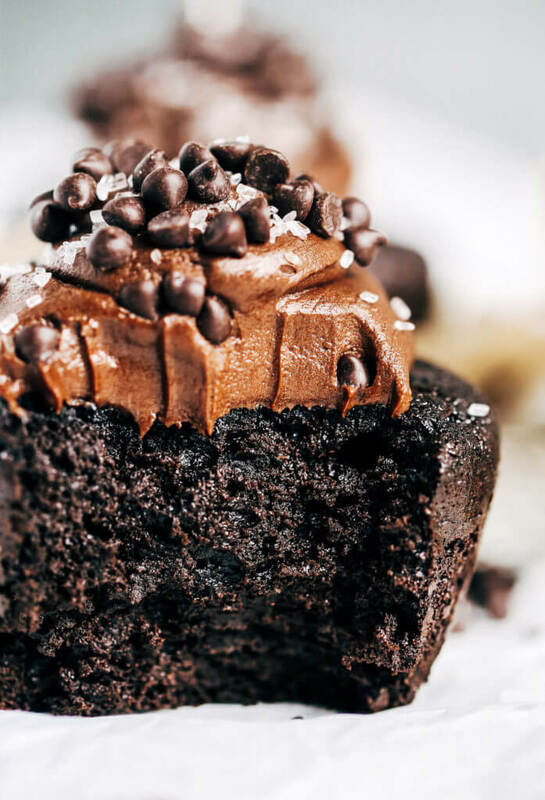 Moist, fluffy, and made in a blender. 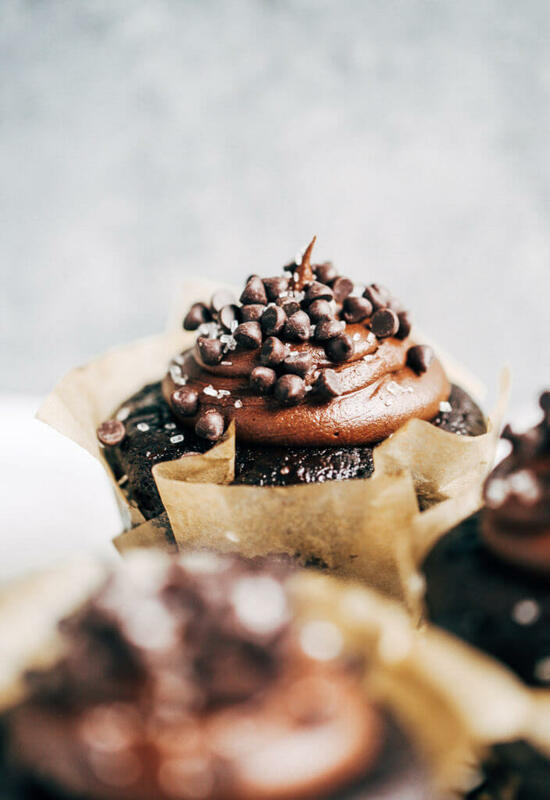 Topped with my favorite easy paleo chocolate frosting. 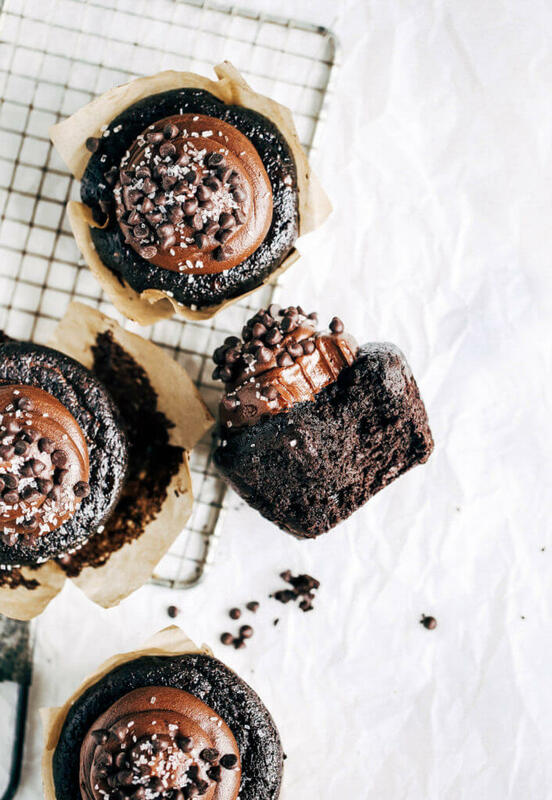 I’m always on the outlook- ready to add new, fabulous, and deserving paleo chocolate cupcakes to my repertoire. There have been plenty, and I mean plenty of recipe testing fails. 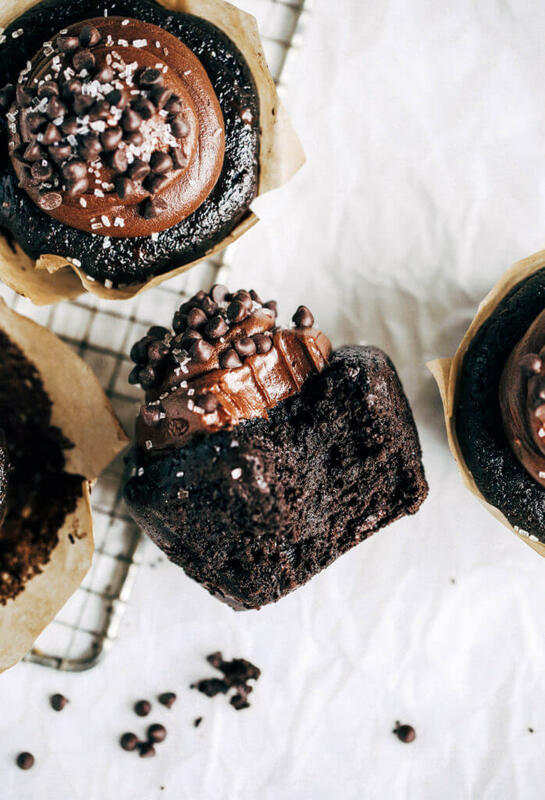 There have been countless chocolate blow ups, meltdowns, and every other kind of chocolate disaster in between. But every so often, a really solid one makes it up in the ranks… and I just go with it. You know those rare moments when deep down… you know your life will never be the same? 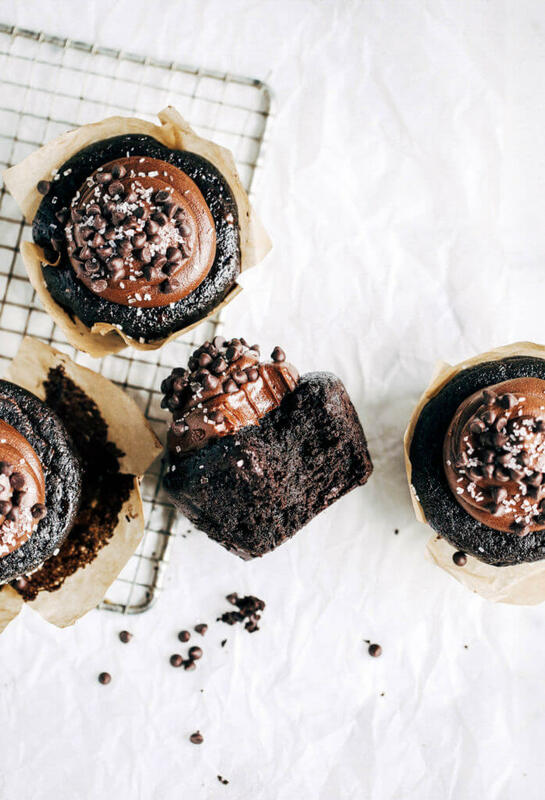 These black-out triple chocolate cupcakes are life-changing. 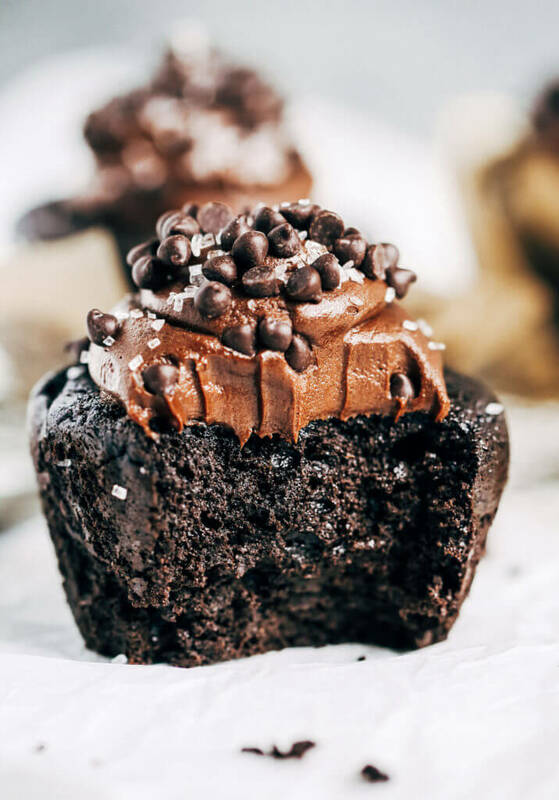 I’m talking ten-star chocolate cupcakes. Yikes! 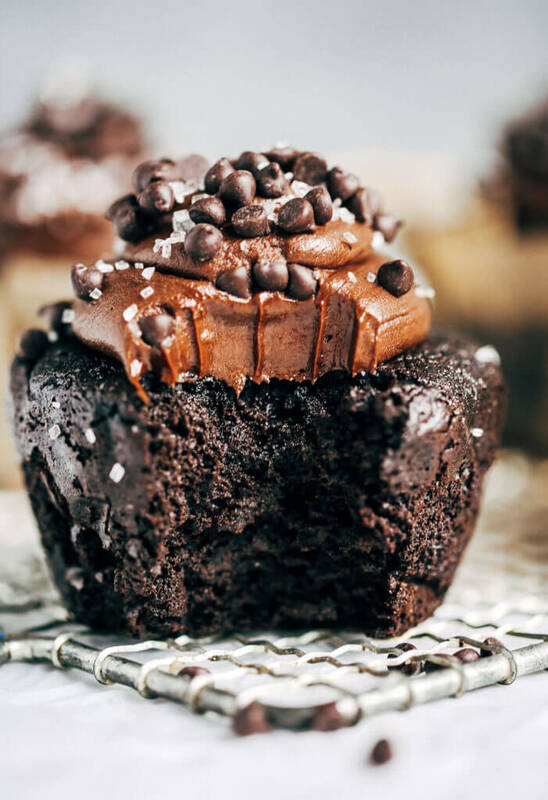 I would out-bid all others for a truly GOOD paleo cupcake. 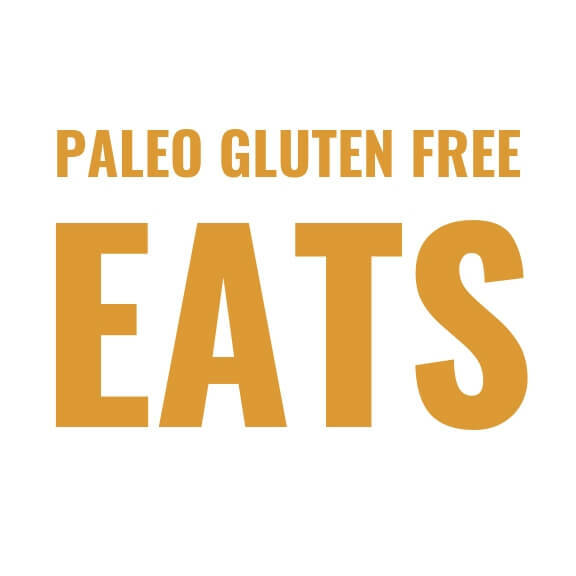 Problem is, truly GOOD paleo cupcakes are hard to come by. 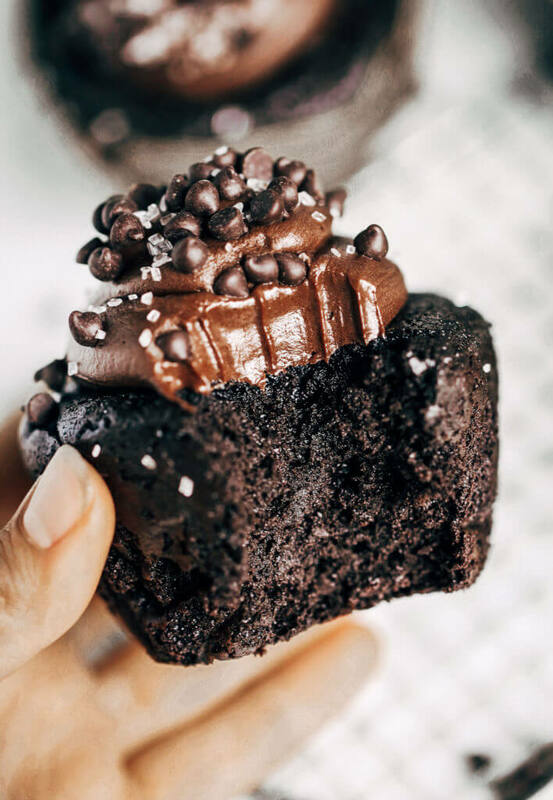 But these have me raising my paddle and rummaging frantically through my pockets to dig up a million dollars to out-bid all others for a bite of decadent, rich, best-ever chocolate cupcakes. I’m picky when it comes to cupcakes. I don’t want to waste my taste buds or daily sugar quotient, on some dry-lousy cake with way too much oily frosting that makes me feel icky. And the cake… well, the cake is on a whole other playing field. Can be frozen, for all us save-for-later people. 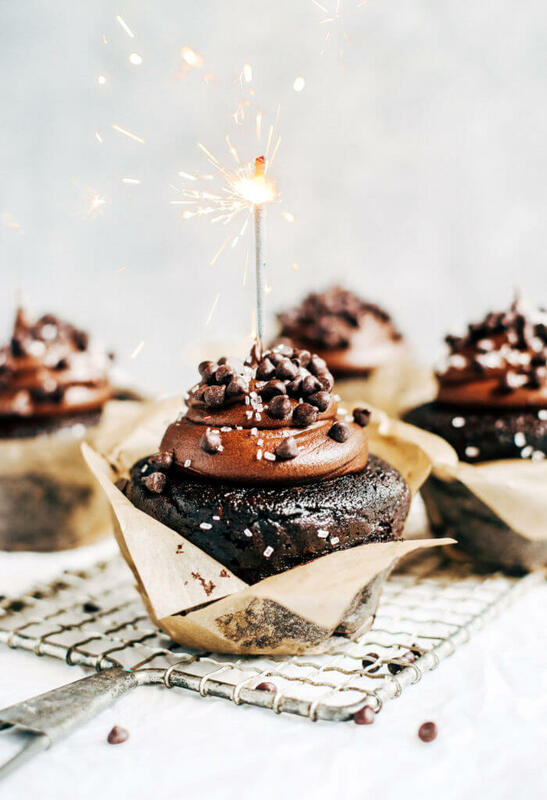 These are the “take me to a birthday party” cupcakes, “make me for a wedding” cupcakes, and the “here, you need these for your graduation ceremony” cupcakes. These past few days I’ve been bumming around the house, trying to kick these seasonal allergies or whatever’s going on. Until I can get on with normal life- it’s me + my sweatpants + this chocolate + my kitchen. Oh glory. Preheat oven to 350F. Line a muffin pan with parchment paper liners. 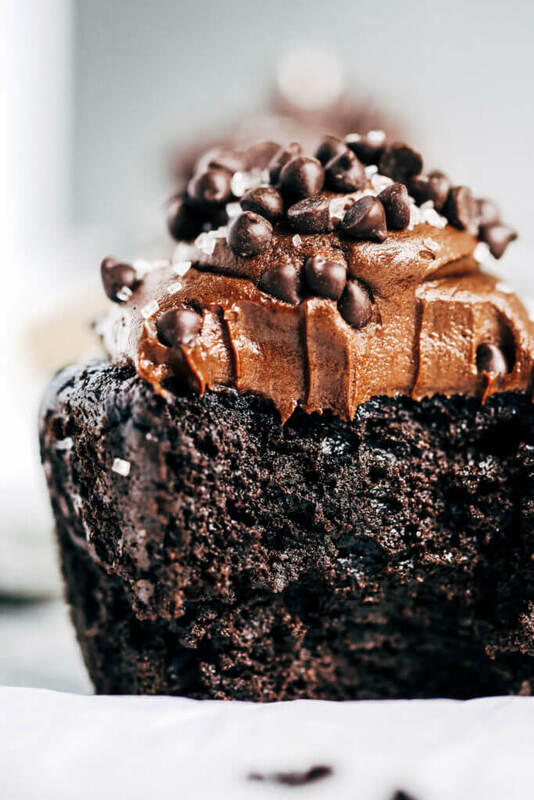 In a blender combine all ingredients for cupcakes until smooth. Fill each muffin pan 3/4 way full. Note: I use a large bakery style muffin pan, which produces 6 large cupcakes. If you use a regular muffin pan- bake for less time (about 20-25 minutes on 350F or until a knife when inserted comes out clean). I bake the large bakery style cupcakes on 350F for 30 minutes. In a double boiler melt ingredients for frosting and whisk until smooth. Transfer frosting to fridge or freezer for 15-30 minutes then whip until it reaches a fluffy spreadable consistency. If the frosting becomes too hard, use a hair dryer and whisk while heating until it becomes spreadable again. 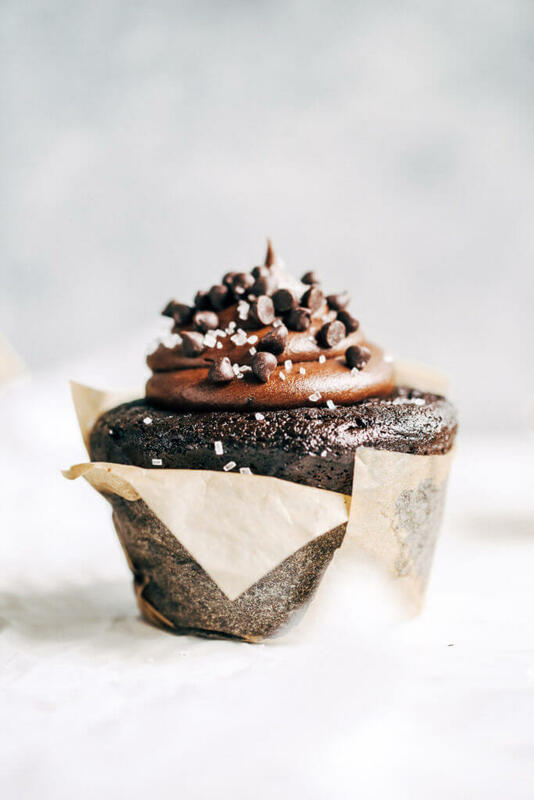 Frost cupcakes. Optional: top with natural sprinkles or mini chocolate chips. 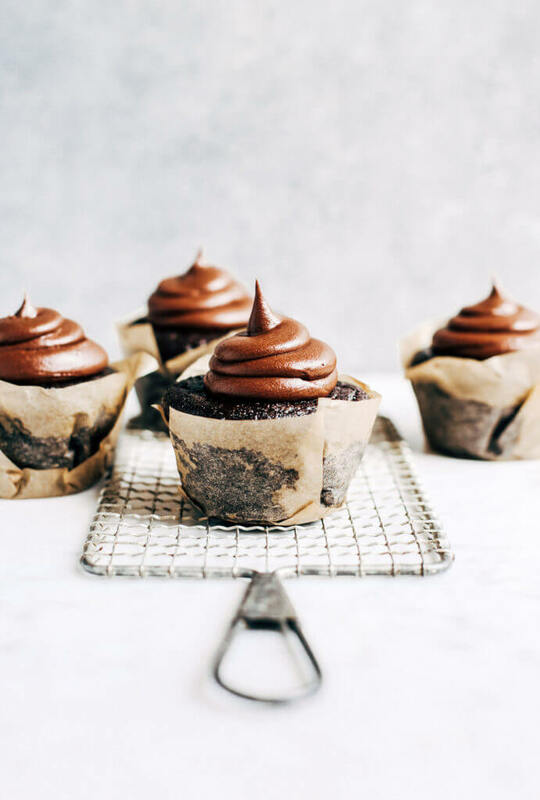 I am also trying one recipe of cupcakes name as Chocolate Nutella Cupcakes. but this one is a bit different and looks tastier. 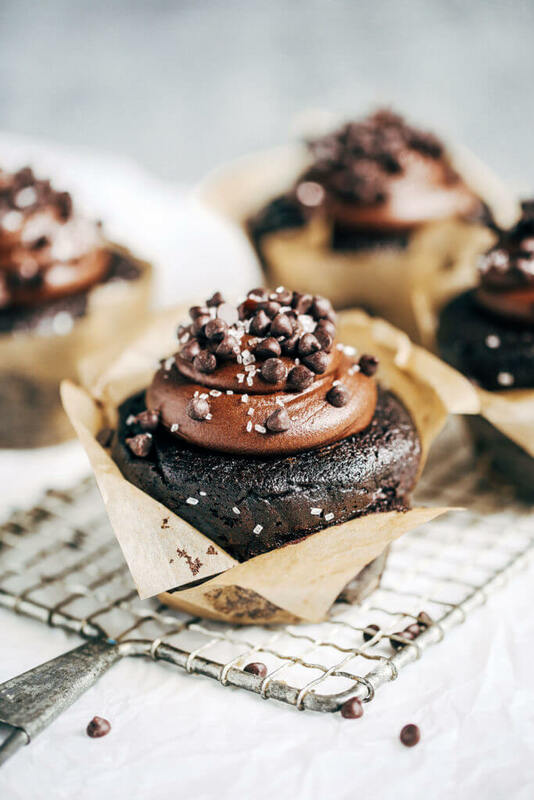 Can I use whole wheat pastry flour for these instead? Sounds good but the almond flour is expensive or is coconut flour a better option? Do you think this could be doubled and baked in two round pans for a layered cake? Looks great! Nut allergy here. Tigernut flour for a sub? It needs to be a fatty flour so clearly not coconut. Tigernut and cassava are mostly starchy….hm…maybe a bit more fat and tiger nut….lmk if you have a suggestion please. Thanks for the recipe! Did you use refined or unrefined coconut oil? I have both and just wondering if these are meant to taste super coconuty or not before I try baking them. Thanks! Still work if mixed by hand? I just finished eating two of these cupcakes. I didn’t have the black cocoa powder; I just used the dutch processed stuff that I had. You were not kidding when you called them life-changing. I am in love! I want to get some of the black cocoa powder so I can try it with that. I think it will be even better! 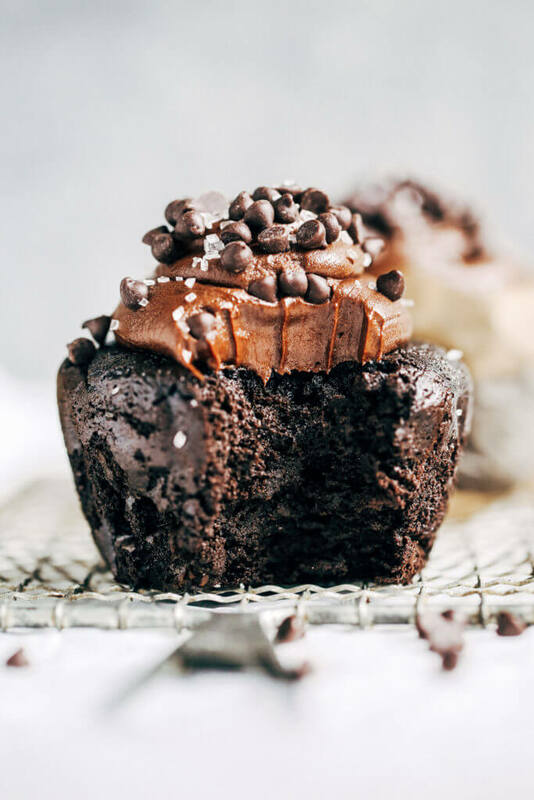 Hi, I would love to make the chocolate frosting to go with these cupcakes but I don’t use Coconut Oil because it is highly comedogenic(causes pores to clog), do you have another suggestion? Mine fell!! What could I have done wrong!? I’m obsessed with your recipes. They are wonderful. Thank you for sharing them!! Hi Ashley, sorry to hear that. Not sure what went wrong. What size were your eggs? Do you just freeze the cupcake without the frosting, or can you freeze with frosting as well? I just made these yesterday. I didn’t have applesauce but found I could substitute mashed banana. They were AMAZING! 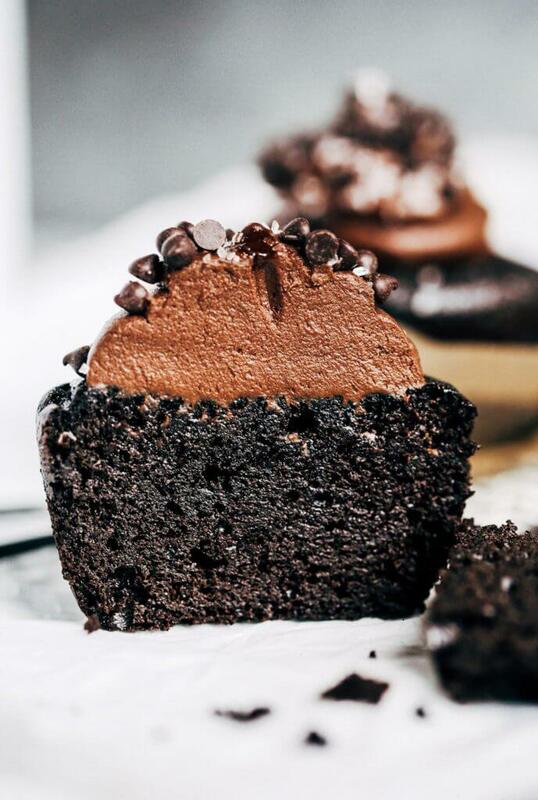 Texture and taste of a good cupcake. Thank you SO VERY MUCH for this recipe. So easy and unbelievably delicious. You’re right on one thing, they don’t taste that good right out of the oven. Once they cooled they were delicious. They came out beautiful. I used the type of icing used on German Chocolate cake and it was too good to be true. Again,thank you. I can’t eat wheat and many substitute flours just don’t taste that great, but almond flour is delicious. These were absolutely amazing! However mine sunk and seemed to be more wet than what your pictures show 🙁 I used large eggs like it said and used a kitchen aid mixer. I really want to make them for my Dad’s 60th this weekend. Any suggestions? Hmmm, I have never had that happen before… did they get over filled? Could I make this in a bundt cake pan? And if so, would i need to increase ingredients for a 12 cup bundt pan? Hi Andrea, that should work great! Sold! 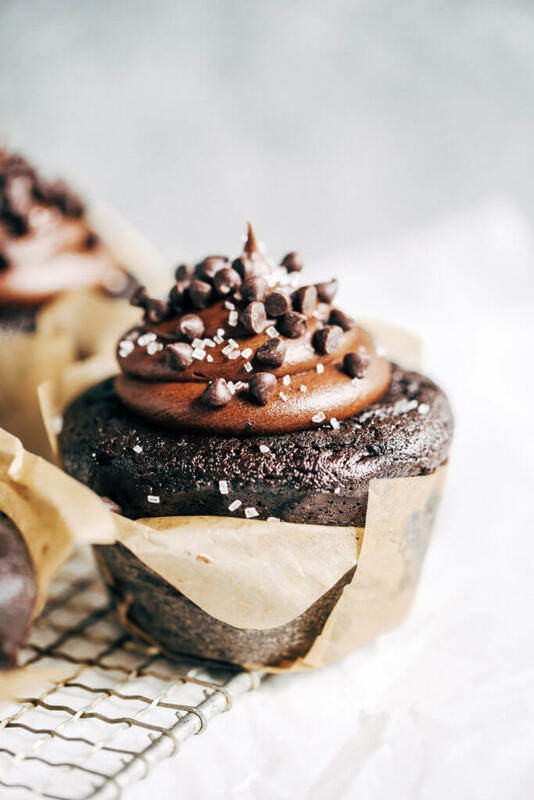 I would like to make these NOW but am out of almond flour. 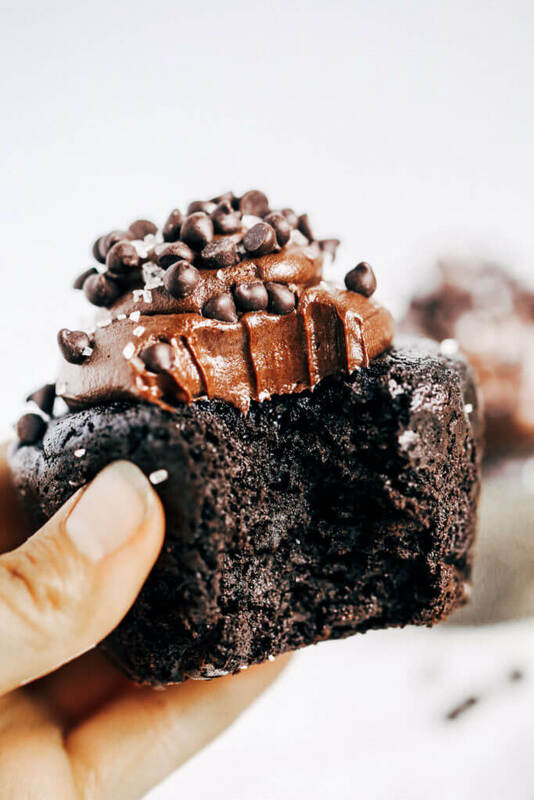 What if I substituted coconut flour? Do you think that could work? Thanks! Hi Missy, you can’t sub for coconut flour, but you can use hazelnut flour. Coconut flour absorbs too much liquid and has a far different texture. Just made these & they live up to the name!! So good. I made them using oat flour instead since my son is allergic to almonds and used aqua fava instead of eggs plus added chocolate chips. Thank you for such an awesome recipe!! Causes pores to clog, coconut oil?? I’m a cancer patient, I thought that was healthy but cloggedmpores sound dangerous. 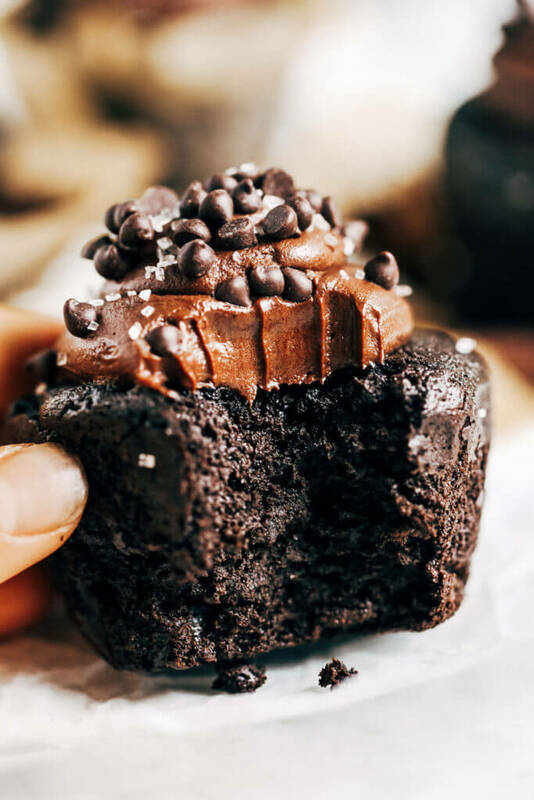 Does black cocoa powder taste different than regular cocoa powder? How does it compare to cacao powder? Which would you recommend? Hi Kaylie, I tried your recipe. My cupcakes in no way look like yours. 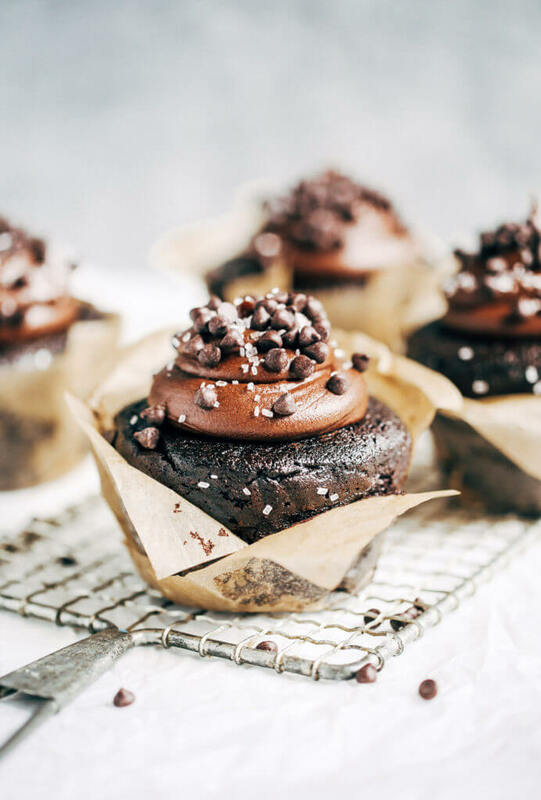 I used flax egg substitutes, and I also used the smaller cupcake pans. Also, I didn’t blend all the ingredients, just hand mixed. When I went to check to see if the cupcakes were done after 20 minutes, they looked beautiful, but then deflated and looked like volcano craters. When I stuck the knife in, they were still really wet and I ended up having to cook them for about 10 more minutes. Do you think the egg substitution or the fact that I disturbed the cupcakes when they still had a lot more baking time caused the cupcakes to deflate? They taste great though. Also, my frosting didn’t looked whipped like yours. Thanks for the recipe. Hi Jaime, yes- it seems the egg sub caused it to sink and not cook correctly. SO amazing! I have made them before and will be making again! 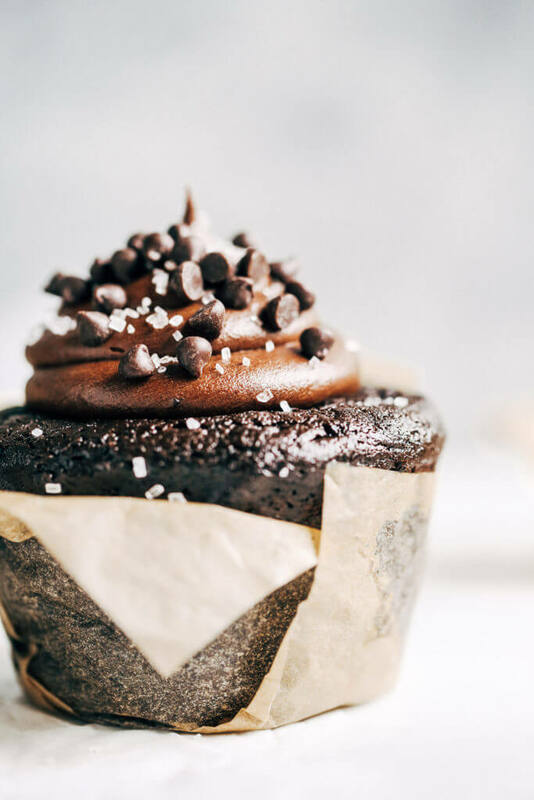 Just wondered if there is a way I can make the cupcake vanilla by exchanging the cocoa with something else? Thank you so much Clare! Hmmm… that’s a great idea, I’m just not sure how well it would turn out. Possibly replace with a mix of almond flour and tapioca?? I don’t know exactly how that would turn out. I love these! 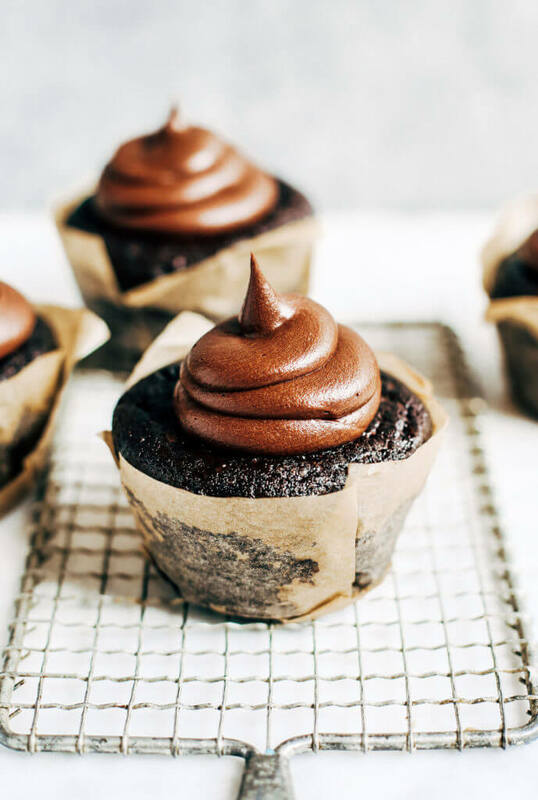 I made them with regular cocoa and they are delicious, as is the frosting. Did you photograph yours using a diferent, whipped frosting? The coconut oil, coconut milk & chocolate taste great, but look NOTHING like what is in your photos! Your look so much more impressive! Hi there, thank you! There is no difference to the frosting- did you whip yours in an electric mixer? I was wondering is the applesauce essential? Im on a strict diet where i’m not allowed fruit. Hi Alessia, you might be able to sub for mashed sweet potato? 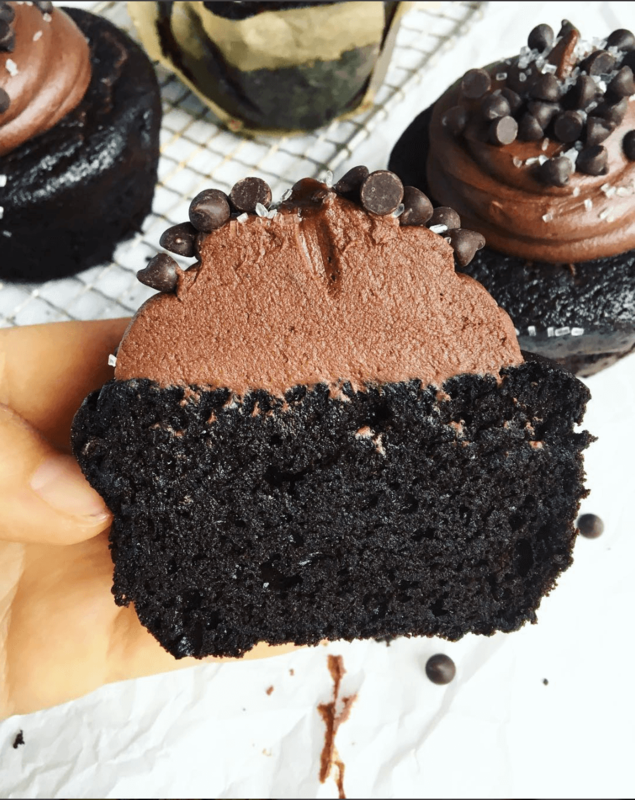 Are your nutrition facts for the jumbo size, or smaller cupcakes? Hi Kendra, they are for jumbo sized cupcakes. My frosting looks nothing like this either, and I am a pretty experienced baker. 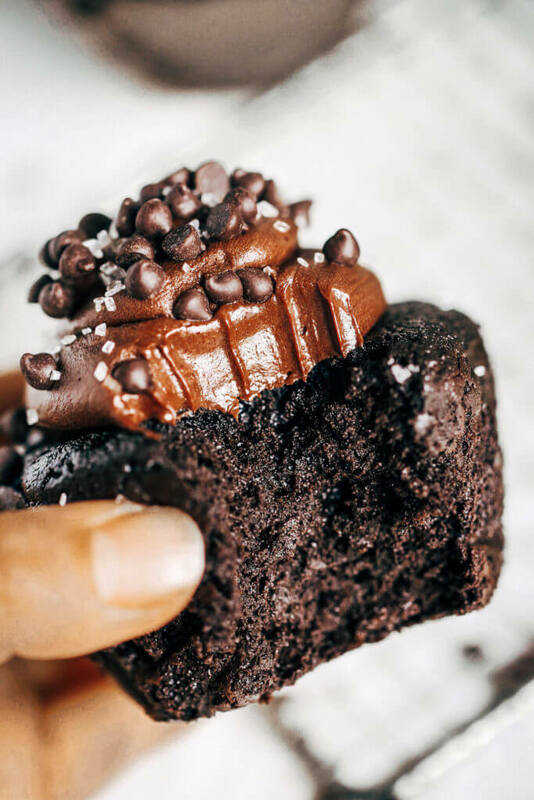 To me, the frosting in the picture appears to have something added for photography. That light color can’t be created with dark chocolate and coconut. Is there supposed to be coconut flour or something in it? Hi Kendra, it’s the same frosting, so I’m not sure what is going on that you’re not having the same results… that’s so weird! Scratch that! Mine DID look nothing like yours, but it was because I needed to whip it a LOT more. After tiring out my arm and working with it a lot, mine also turned that color, piped on beautifully, and were perfect for my daughter’s birthday. Our only complaint was we couldn’t eat the whole thing! Thanks for a great recipe that I could eat on a low carb diet without feeling too guilty. Oh good! Glad we figured it out, thanks for sharing! I didn’t see in the directions that the frosting needed to be whipped, glad I read the comments! That totally changed the consistency of the frosting!! Hi Norma, I usually store my baked goods in the fridge, because almond flour can go rancid if left out.